From risk manager to change agent – what makes an innovative lawyer in North America? The Financial Times today announces the winners of the FT North America Innovative Lawyers awards, in partnership with RSG Consulting, founder and research partner of the report and award series. The event and publication recognises the most innovative and entrepreneurial lawyers, original thinkers in private practice and in-house legal departments in North America. As the region’s business practices change to adapt to a shifting landscape, the role of lawyers and legal frameworks has equally evolved. “Besides this technological disruption, we are living in unprecedented times of political and economic uncertainty,” says Reena SenGupta, CEO of RSG Consulting. “Times in which the usual ways of conducting government, trade and business have been turned on their head. Innovation, as we all know in the legal profession, is not just about the automation of legal services or hiring legal engineers. It is also about being the best legal professional you can be, the one that is most appropriate to what society needs.” The report celebrates the best of these strategies. This year’s edition is the biggest North American report to date, featuring expanded coverage of the region’s in-house operations – we have received more submissions and ranked a greater number of teams in North America than ever before. The report also features a dedicated chapter focusing on Canada, providing an in-depth analysis of the legal market. The top honours were awarded to Wendy Butler Curtis, (Orrick), named Most Innovative Lawyer; Orrick, named Most Innovative North American Law Firm; and Honeywell, named Most Innovative In-House Legal Team. The ceremony was hosted in Gotham Hall, New York, last night. We would like to congratulate all the winners and runners-up and all those who participated. We would also like to thank our sponsors Concord, Elevate, HighQ and Quislex, as well as our in-house section sponsors, White & Case. The themes and winners from this year’s programme are summarised in the FT Innovative Lawyers 2018 North America report which can be found here. Congratulations to all the law firms and in-house teams ranked in the FT Innovative Lawyers Europe 2018 Report, published by the Financial Times today, available to read online here. Particular congratulations to our winners, who demonstrated a new way of thinking about the challenges they face, be it a client’s legal problem, internal inefficiency, or their purpose within the community in which they operate. Each year we are asked the same questions: what is innovation in law firms, and how can law firms be innovative? Well, from over 13,000 interviews on over 12,000 submissions over the last thirteen years, we can share some insight and ready-made consulting advice, that can help you to sail into the wind and lead your firm into a new chapter in its story. RSG’s new RSGi report, ‘How To? 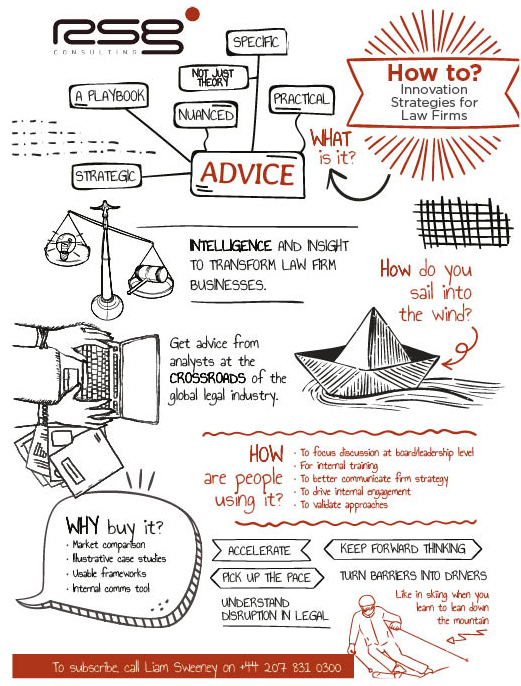 Innovation Strategies for Law Firms’, distils the company’s wealth of market intelligence and the insight from Reena SenGupta, whose experience in the field needs no introduction, to bring you a guide on what innovation looks like, including case studies from our best examples of legal innovation. We know the challenge that law firm leaders have in creating – and sustaining – a culture of innovation. Obstacles such as the billable hour, law firm structures, remuneration systems and the very nature of lawyers as professionals mean that the challenges are perennial. Being a relevant law firm is about far more than knowing the best technologies to use. It is about understanding lawyers’ behaviours and what motivates them. It is about leadership and management. It is about truly hearing the voice of the client. And finally, it is about what works and what doesn’t. Constructed as a slide deck with case studies, we have created a practical aid and resource for anyone tasked with developing strategies to better lead their firms. RSG’s learnings and frameworks shared in this resource are drawn from thousands of interviews – with law firms, general counsel and the C-Suite – about how they have created innovative teams and organisations, both for the FT reports and other RSG projects. These are illustrated with concrete examples of how initiatives are conceived, implemented and have an impact in law firms. We compare our insights into how law firms innovate to those of leading innovation scholars and thinkers such as Clayton M. Christensen and Steven Johnson, so that the slides can be used for multiple purposes. The resource includes the answers to the following questions with our analysis of specific case studies to illustrate the key learnings. The slides can be leveraged by different law firm departments. Are law firms different from other businesses when it comes to innovation? We have chaired many round-tables where this question arises. There are arguments for and against. Here, we analyse the obstacles to innovation in law firms and present the best approaches we see from firms who have been able to overcome these obstacles and encourage, what initially appear to lawyers to be, counter intuitive behaviours. What is an innovative law firm today? Since 2016, Europe, in particular, has witnessed more change in its top law firms than it has in the last twelve years. The benchmarks of what is considered innovative are constantly evolving. Here, we analyse the most significant developments globally in 2017 and examine the facets of what currently constitutes law firm innovation. Service delivery models. Most law firms have accepted that their service delivery models need to improve. However, lawyers’ take up of their firms’ alternative delivery options and capacity to see how it applies to their specific practice areas can be slow. This section covers the elements of successful delivery models in law firms. It focuses on how firms can best create new service delivery models; how they can get buy-in within their firms to develop them and how they can bring them to market in a way that complements their advisory work. Technology. 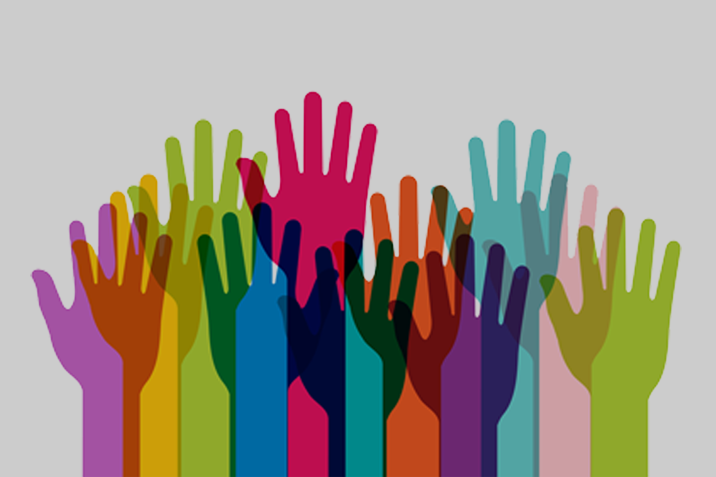 Even in the most advanced law firms, becoming tech-enabled is a “minority” sport. But law firms have developed fast over the past three years in terms of integrating technology into their practices. Here we illustrate the best ways we have seen law firms’ enable their lawyers with technology and the thinking behind them. Where are leading law firm adopters of technology employing it today and with what results? How do firms create and implement a successful technology strategy? How does a firm empower its lawyers to use technology effectively? Productising legal services. The trend towards standardising elements of the legal process into products has been underway for over a decade. There is a bifurcation in terms of the types of legal processes being productised: those for business development purposes and those for the provision of legal services. However, although there are many examples of where productising legal processes have been successful there is still an inherent risk – how does a firm balance the benefit of productising its services with the risk of compromising existing revenue streams? This section looks at how firms manage this balance effectively. Data. Law firms increasingly use data to deliver new services to clients or to gain strategic advantage. Although few firms have a formal data strategy, they are beginning to collate their own intelligence and turn it into data to enhance client relationships and management strategies. Clients are getting savvier about collecting their own data on outside law firms and we explore some of the ways in which this is creating change in law firm practices. What is an innovative lawyer today? The role of a lawyer on a transaction or litigation matter has evolved greatly in the past two decades and continues to evolve. RSG’s new framework as to what makes an innovative lawyer lays out the skill sets, experiences and attitudes partners need to have for the next five years and how best to acquire them. It profiles two core types of innovative lawyers globally who are driving innovation in law firms and exhibit certain characteristics: the change agents who are driving enterprise-wide innovation in their firms and the legal practitioners who are focused on creating new practice areas in their firms and continue to deliver extraordinary value to clients. How do you teach lawyers to innovate? How are law firms and in-house teams creating innovative mindsets in their people? Many law firms are experimenting and focusing on inculcating innovation in their firms through exercises such as design thinking workshops, internal innovation contests and redefining their purpose as lawyers. They are also being pushed by their clients and new competitors to be more innovative, many of whom work for companies whose core business model is centred around innovation. Getting true client-centricity: Despite state-of-the-art client listening programmes, top law firms often complain that their partners are still not aligned enough with their clients. We share some of the unique insight we have gained from ranking hundreds of corporate law departments on their innovation and thousands of client interviews for our thought-leadership reports. In this section, we identify and analyse the most critical developments affecting law firm clients. We make the case as to why, for partners, innovation should be a critical pillar of their strategies. Collaboration: It is a critical driver of innovation, but many law firms struggle to create internal collaborations, let alone external ones. Who should law firms be collaborating with and how? How can smart collaboration entirely alter the innovation profile of a law firm in terms of both legal expertise and business approach? Balancing innovation and financial performance: Are innovative law firms more successful financially? We have correlated the financial results of the top 50 global law firms with their Financial Times innovation scores over a three-year period to answer that question. In addition, we tackle the question of how you can prove to doubtful partners that innovation does benefit clients and lawyers. Why should law firms subscribe to RSGi: How To? Trusted Insights. Exposure to RSG Consulting’s core insights drawn from nearly 30 years in the profession for CEO Reena SenGupta, who’s experience includes: a history of creating the research methodology for the Chambers & Partners Guides in the 1990s, producing numerous thought-leadership and strategic projects for law firms at RSG Consulting and being the long-term research partner to the FT Innovative Lawyers programme. Strategic advice. 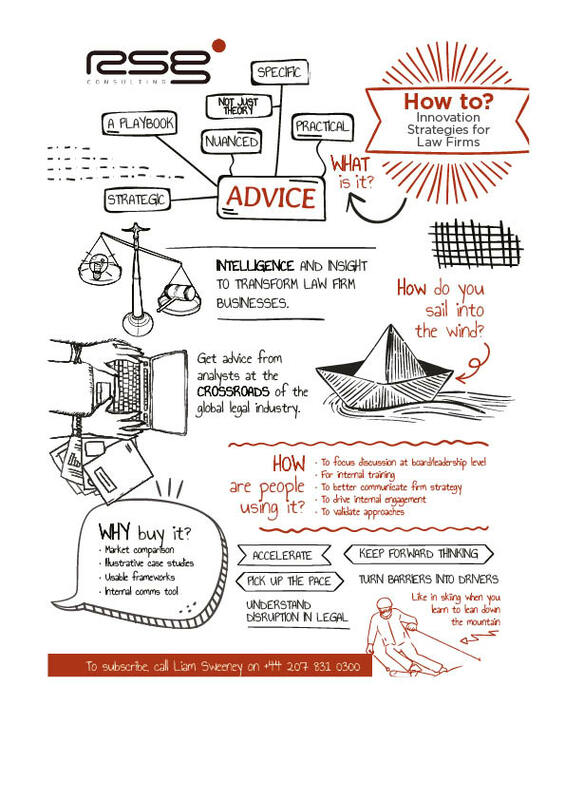 Through case studies and in-depth playbooks, the ‘How To?’ resource gives legal leaders expert insight, analysis and strategic advice on how they can develop an impactful innovation strategy in their firms. A client-centred approach. 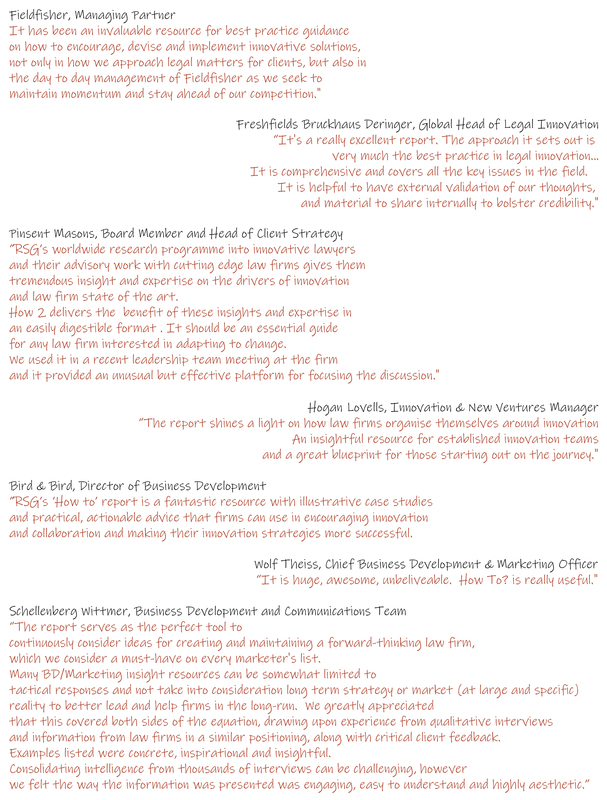 The resource also includes client perspectives on law firm innovation. It provides unique, contemporary and fresh insight into the evolving role of legal departments within global companies and their requirements from legal suppliers. International perspectives. From the breadth and depth of RSG’s reach into the global centres of legal innovation, we are uniquely able to provide a broad and global perspective into key trends and analyse nuanced changes in direction in the sector. Multiple use cases. How To? can be used by multiple stakeholders within a law firm for different purposes: developing an innovation strategy; training and development; business development and as a resource to build internal platforms to get buy-in to an innovation agenda. Using the RSGi: How To? Resource as a baseline, RSG can run a half-day session for law firms to create or refresh its corporate strategy. The session includes: assessing the firm’s overall innovation capabilities against the market and identifying areas where improvements will have the greatest impact from both a short and long-term perspective and sharing our ideas as to how the firm can innovate better. Frameworks and insights are drawn from nearly 30 years analysing the legal profession, including consulting and major research assignments for law firms, corporate law departments and other professional service firms. In particular, analysis on how law firms innovate is compared with academic and scholarly research into how innovation occurs in business and in science. Case studies are drawn from over 10,000 submissions on innovation received from law firms and legal service providers and over 11,000 research interviews conducted with leading lawyers, law firm managing partners and chairs, company general counsel, CEOs, and other legal industry clients since 2006. 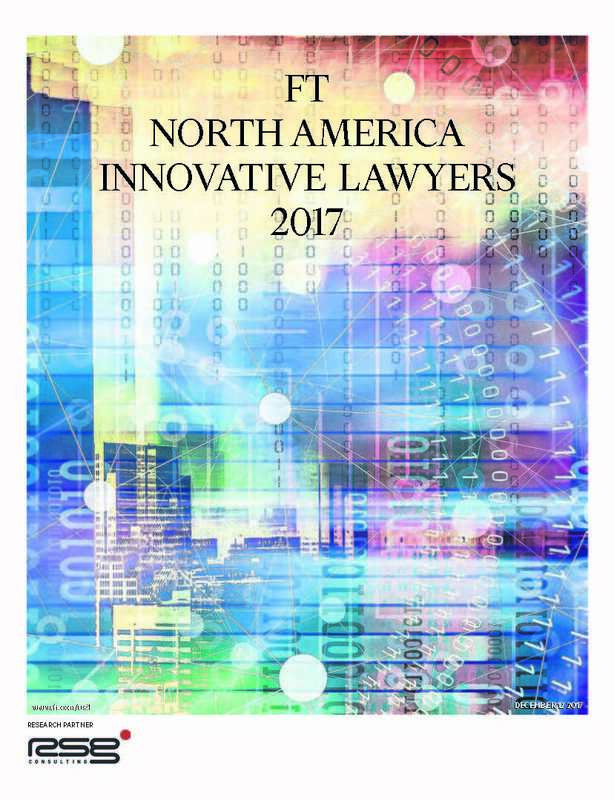 The FT Innovative Lawyers Report North America 2017 has now been published, and can be accessed in full here. Thank you to all those who submitted this year. On Monday we held the awards for this report at the Public Library in New York. It was a fantastic evening; the room felt full of energy as we brought together some of America’s finest lawyers. This year’s report for North America comes at a time when long-established tenets of democracy – the rule of law, legal equality and political freedom – are under stress, and we consider the role of lawyers to be more crucial than ever. Consequently, we have introduced a new category on the rule of law and access to justice to cast a spotlight on the important work lawyers are doing to protect and extend the rule of law across the region and around the globe. We have also dramatically increased our coverage of in-house legal teams to match private practice. The report provides a comparison of how in-house and private practice lawyers are innovating, as well as how lawyers are collaborating in new and exciting ways. Our sincere congratulations to the winners, and all those who received a ranking this year. With over 530 submissions (an increase of almost 50% on 2016), competition was tougher than ever and it’s encouraging to see so many firms and in-house teams committed to driving change in the legal sphere. We hope the report continues to be a platform to showcase innovation in the legal sector and look forward to some outstanding submissions in 2018. Our submissions will open for the FT Innovative Lawyers Asia Pacific 2018 tomorrow and can be accessed here. The submissions deadline for this report is 27th January 2018 and, following exciting and successful coverage of the rule of law in Europe and North America, we will be extending this category to Innovative Lawyers Asia Pacific 2018, and inviting submissions in “the rule of law and access to justice” to highlight the critical lawyers are playing in society. We will also be expanding our coverage of the Australian legal market to introduce a separate chapter covering Australia in the Asia Pacific report together with a full day summit in Sydney on 5th June after which we will present three distinct awards for work undertaken within the Australian legal market. Another key date for your diaries is our annual global summit which we will once again be holding in London in June. Further information will be released in due course but if you would like to register your interest, do get in touch. Other new additions to Innovative Lawyers will include a new report, “Tomorrow’s Law”, covering legal tech, alternative legal services providers and other active disruptors of the legal industry. For further information on any of the reports or events mentioned above please contact us. What is the difference really these days? We struggle to put submissions into their definitive categories more than ever. Does that mean have it wrong, the firms have it wrong or that really the two are converging?